One day, nearly a year ago, Thomas (age 9 then) was asked what he wanted to be when he grows up. He gave me a long look, like he was trying to decide if he could trust me with this information, and then he said, "I want to be an archaeologist. You know, like ancient Greece or ancient Rome. I want to go and find stuff that will help to prove the Bible is reliable." Okay, so that kind of hit me from left field. I had no idea. So I started researching to see what types of resources I could find for him that would encourage this interest. And although it isn't being planned for his big brothers, we have started to collect information to have one of his high school history courses focus on classical history (Rome/Greece). In my poking around, I came across a website called Dig-It! Games, that was advertising a computer game called Roman Town. I read everything I could about it, and then put it on a list as something that Thomas would be getting for his birthday (November) or Christmas, assuming he was still saying he was interested in archaeology. Imagine my absolute delight when I found out that Dig-It! Games was one of the vendors for the Homeschool Crew. And we received the product mere days before Christmas. Ours was a download version, so I printed out the cover (at the right) and wrapped it up for Thomas. The child got legos, bionicles, all kinds of amazing stuff. But that little piece of paper -- once he realized what it was -- became his absolute favorite gift. Once he played it for the first time, he was practically crying. "Thank you, thank you, thank you! This is the. best. gift. EVER!" Obviously, from that long story, you know that this is a product I am going to heartily endorse. I think this would be a fabulous educational supplement for a study of ancient history, for a study of archaeology, or for students studying Latin. Do I think the game is perfect? Of course not. First, I'd love if it was available for a Mac (apparently they are working on that) instead of just the PC, as that has limited the amount of time Thomas is able to play it. I also think the game would be hugely improved if there was an option to have some of the text read to you. As it is, Thomas needs to have someone around to help him through the text-heavy portions. That has been a good thing for this review, actually, as it means I am generally more aware of just what he is learning. However, I would still like it if he had the ability to do it more independently. And it is certainly possible to play the game without really learning anything. Thomas is motivated to learn, so he makes a point of reading all the extra information. Connor (my Latin student) wants to read all the cultural information, so he has also played through, reading all the text. But be aware that a student could "just" play without really learning the valuable information that is presented. And now, the real review. Courtesy of Thomas. 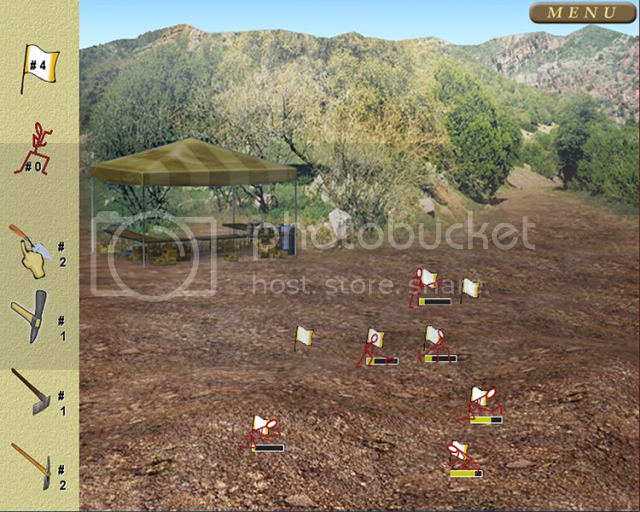 This game teaches kids how to do archaeology and about Roman history and culture. You join an archaeological dig in this little Roman town, and as you dig up artifacts you learn about them. 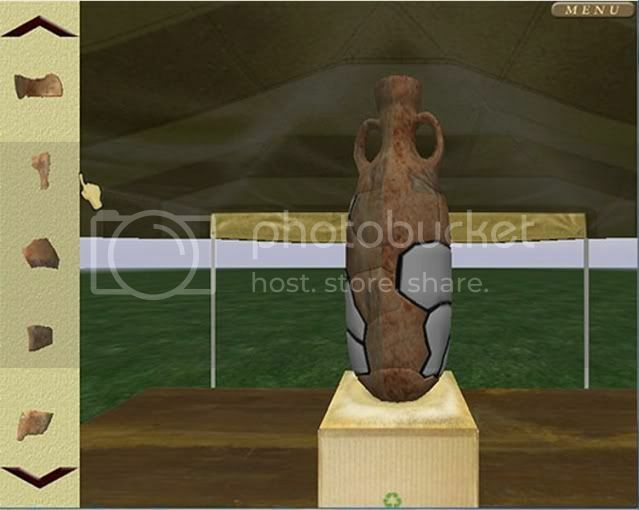 After each dig, you go back to the lab where you can rebuild artifacts, and then classify the items. Finally, you write up a report about your findings and move on to the next level. I give this game 289 stars, and I hope that they will come out with a second one. I think that this is a game that lots of kids would enjoy, but it would be especially good for kids who are interested in history or archaeology. My big brother thinks it should be a part of any Latin curriculum. But I'll let him tell you about that. As a Latin student, I think this game would be a fun way to reinforce a lot of the household vocabulary (they teach the names of the rooms, for instance) and Roman culture and its similarities and differences with our culture. 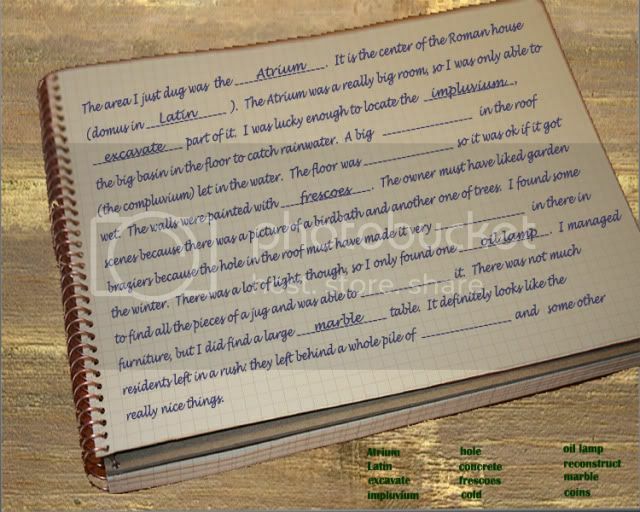 Many Latin classes include Roman cultural information, and a lot of the things taught in this game are included on the NLE (National Latin Exam). I think any Latin student would benefit from the opportunity to use this program as a fun way of exploring Roman culture and Roman home life. However, I do think that giving it 289 stars is a bit excessive. It certainly deserves 5 out of 5 though. One thing I really appreciate about this program is that it does encompass a pretty full range of what an archaeologist does. Another is that the dig is different every time you play. You can have up to 5 users at any one time, and each will find a different set of artifacts. I assume some of that varies with which digging tool you use. I also appreciate that this dig doesn't have them finding phenomenal groundbreaking items. They are digging up coins, pottery fragments, pieces of mosaics, etc. It feels realistic, based on my limited understanding of archaeology. In addition to the game, you can also purchase an educator's manual that looks ideal for classroom use, and great for parents whose students are particularly interested in archaeology. The educator's manual is $19.95, and the game is $39.95. Through February 21, though, you can use this code -- TOS2011 -- to obtain the program for just under $20. Go here to purchase. Disclaimer: As part of the TOS Homeschool Review Crew, I did receive a complimentary download of this program from Dig-It! Games. The fact that I received complimentary products does not guarantee a favorable review. It does guarantee a review. A fair review. But I am not going to praise something unless I think it deserves the praise. If I don't like it, you'll hear that. And hopefully with enough detail as to why so you can decide for yourself if what I hate about it makes it perfect for your family. For more about my take on reviews, visit my blog post here. My kids really enjoyed this game too. My son can't wait until the next game comes out. How wonderful that there was a game that was geared towards Thomas' chosen profession. I enjoyed the addition of the kids' opinions. I'm from the TOS Crew and am now following you. Please follow me. Thank you!